Layers of Protection - Central States Mfg, Inc. Learn what makes up a quality metal panel. Manufacturers offer panels that look the same, but can vary widely in quality and performance. To help you make an educated decision you should understand these specific layers: the paint layer, the anti-rust layer, and the steel core. Use this information to make an informed decision about your next metal purchase. Ask your current metal supplier to explain the layers of protection that are included in their quote. 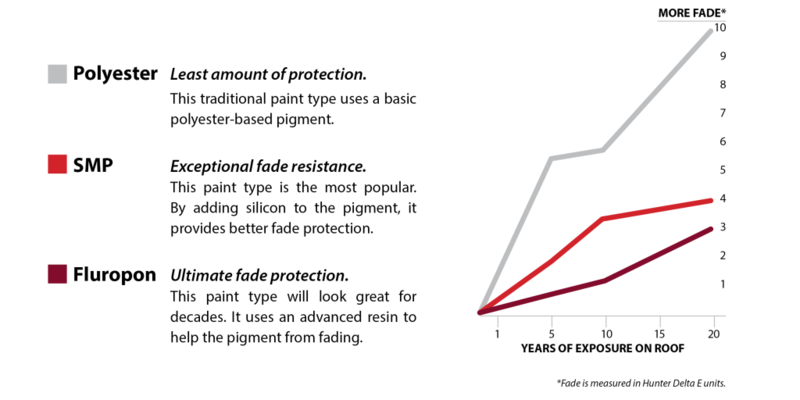 Fade protection is a balance of paint type and thickness. A warranty can give you peace of mind when investing in a new metal roof. Don’t assume that warranty is an indicator of performance. No one wants a metal roof that is faded, no matter how long the roof lasts. More than the term of the warranty, you should be concerned with fade protection. Fade protection is a result of the type of paint used and how thick the paint is applied. A manufacturers warranty should list the acceptable amount of fade the warranty allows. The paint system you choose affects fade performance. There are three major types of paint used in the metal roofing market: polyester, SMP, and Fluropon®. Click on the chart below to see how the three paint types fade differently over time. Some metal panels have a thin coat of paint, but offer the same warranty. 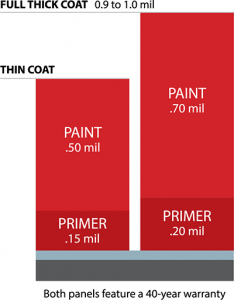 A thicker coat of paint fades less, but costs more since it contains more paint. The marketplace offers metal panels with 40-year warranties at a wide range of costs. Ask the manufacturer for their paint thickness on the panels you are considering buying.You may find that the metal you were quoted features a thinner, cheaper coat of paint. A full, thick coat of paint should be between .9 and 1.0 mil thick, including primer. Rust blocking is a balance of substrate coating type and thickness. Manufacturers use one of two different rust-blocking coatings on metal panels, galvanized or Galvalume®. Your metal panels will have one of these two coatings applied between the steel core and the paint layer. If the paint is scratched, the rust-blocking coating is designed to prevent rust from reaching the steel core. Your 40-year warranty refers to paint only. Manufacturers may include a separate substrate warranty depending on the rust-blocking coating you choose. Ask the supplier if your quote includes a separate warranty for the substrate coating. Painted galvanized panels show little edge-rust for the first 10 years. Galvanized coatings are the traditional rust prevention method used in the metal industry. 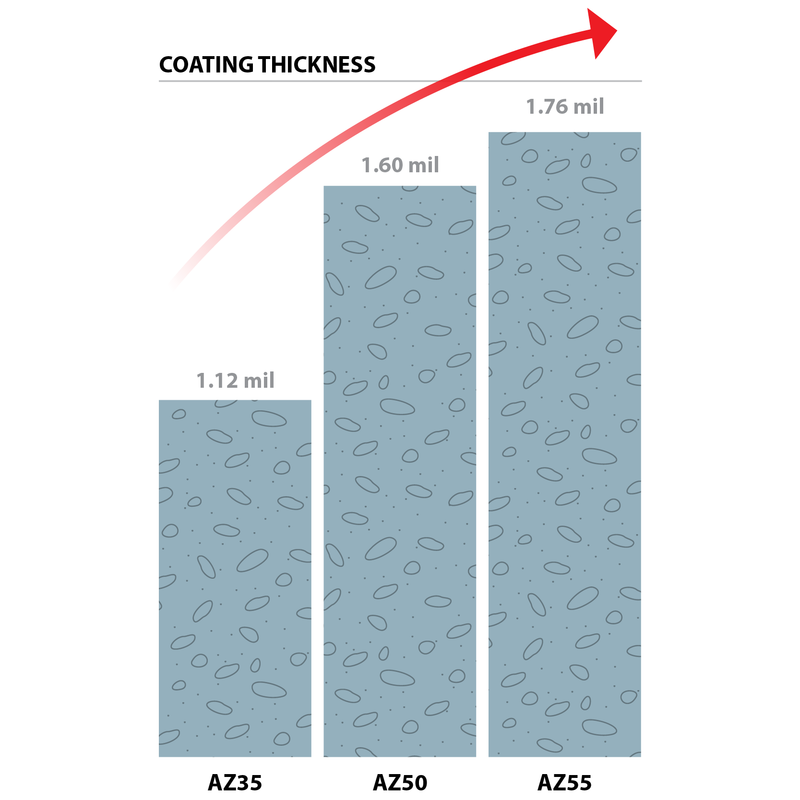 This coating uses rust-inhibiting zinc, which protects the steel core from corrosion at the panel’s edges and any surface cracks or scratches. The thicker the layer of zinc, the longer you have before it corrodes away and exposes the steel substrate. Galvanized is offered in three common levels of protection: G40, G60, and G90. The higher the number, the thicker the layer of zinc that will protect your metal. Choose the thickest coating of zinc for the most rust blocking when choosing a galvanized panel. Painted Galvalume® panels offer more long-term protection over galvanized. Some manufacturers offer a rust-blocking coating called Galvalume, which mixes aluminum and zinc. Aluminum is highly resistant to corrosion. The aluminum will stop any rust that may occur in the zinc, and the steel will remain intact. After a small amount of edge-rust, Galvalume offers up to four times the protection of comparable options. Galvalume is also offered in three common levels of protection: AZ35, AZ50, and AZ55. The higher the number, the thicker the layer of aluminum/zinc that will protect your metal. 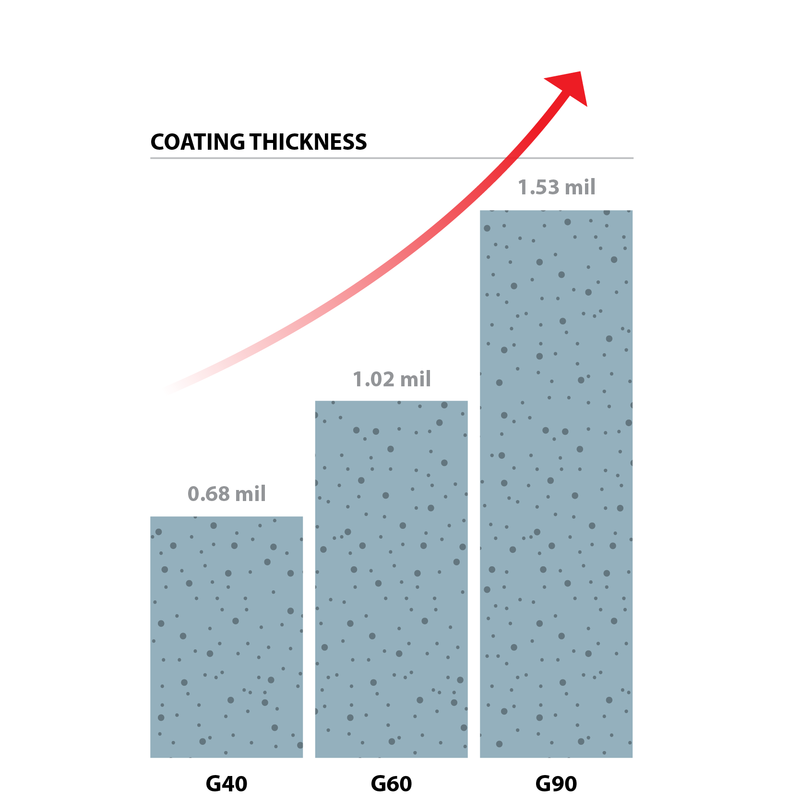 When selecting Galvalume, choose the thickest coating of aluminum/zinc for the most rust blocking. Dent resistance is a balance of steel thickness and hardness. Focus on dent resistance instead of gauge. 29 gauge metal roofing comes in a wide range of thickness and hardness levels. That’s not a typo. 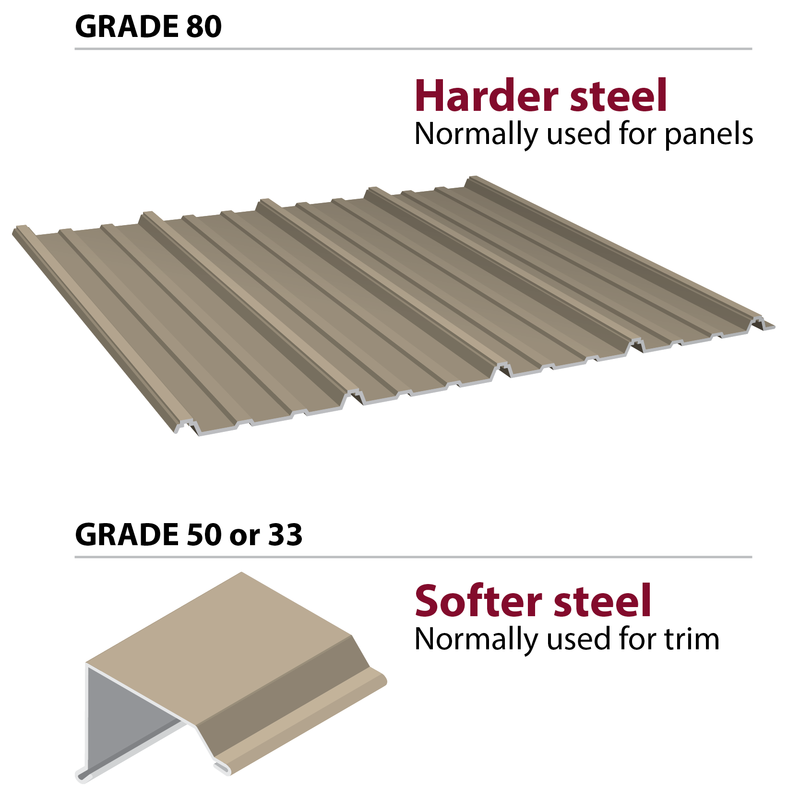 You really can buy a thinner 29 gauge metal roof or a thicker 29 gauge metal roof. There’s not a huge difference in price for the better product, but you’ll definitely see a big difference in performance against hail and other dents. By understanding dent protection, you can dramatically improve your roof without much impact to your wallet. Simply asking for a specific gauge is not enough. 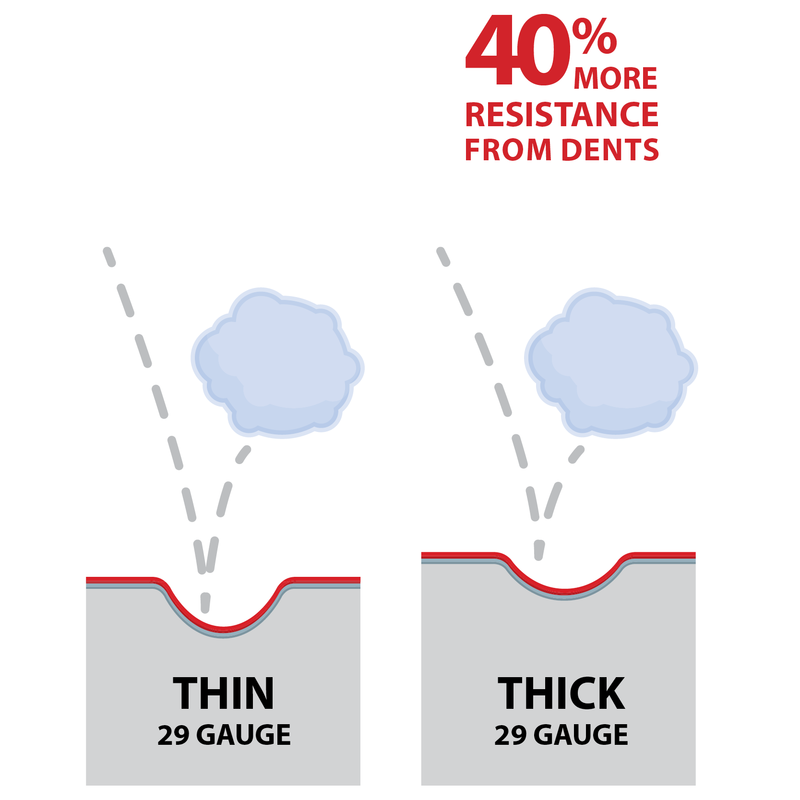 There can be a 40% difference in dent resistance between thin and thick 29 gauges. In the metal industry, gauge is a range of thicknesses that manufacturers have to stay within. With profitability causing pressure on costs, many manufacturers are offering the thinnest metal that is allowed within the gauge. So, it is important that you understand the thickness of your metal so you can make an informed decision. There can be a 40% difference in dent protection between the low and high end of 29 gauge. This difference in dent protection is an important consideration when investing in a metal roof. Metal roofing is produced from different hardness grades. Grade 80 is a hard steel used to produce metal panels of 26 or 29 gauges. This combination of thickness and hardness is great for metal panels that require dent resistance. Making trim from Grade 80, however, will cause tiny cracks in the metal, exposing it to rain and eventually rust. Since trim has lots of sharp bends, it is better to use a softer steel such as Grade 50 or 33. Many manufacturers can only afford to carry one grade of steel. This results in either making panels out of soft steel that will dent, or trim out of hard steel that will crack. Make sure and ask your supplier about the hardness of their metal.